Phonics are a proven, effective, teaching tool for learning to read. Learning letter sounds and how to blend those sounds together is the very foundation of reading. Of course, learning to recite the alphabet is the first and most important step in learning how to read. After this skill is in place, students are ready for the next step in learning how to master reading. If you need help downloading the lesson worksheet, check out these helpful tips. Introduce the consonant sound first. Choose the child's favorite letter, such as the first letter in their name. Find familiar objects that start with the same letter, and ask the child to say the word. Ask the children to name other things that have the same beginning sound. Hand-out the worksheets, and read the instructions. 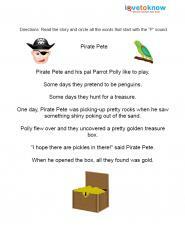 Most children enjoy pirate stories and will enjoy hearing about Pirate Pete and his parrot, Polly. Ask them to repeat the sound back to you. Ask the children to pick-out three things in the room that have the beginning "P" sound. Read the story on the worksheet. Have a couple of props to help animate the story (pirate doll, stuffed parrot or toy chest). Ask them to follow the instructions on the sheet. Help the children correct their work when they are done. 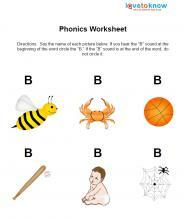 Lesson Plan - The Letter "B"
Introduce the beginning "B" sound. Ask the students to repeat the sound. Collect ten common items (5 that start with the letter B and 5 that don't). Ask the children to put all the "B" sound items into one pile and the other items into another pile. Hand out the worksheet, and read the instructions. Correct the work with the students when they are done. It's important to point out to students early in their reading lessons that there are special letters known as "vowels," and that the other letters are known as "consonants." Vowel sounds can be taught after children have mastered consonant sounds. It is important to point out that vowel letters can have two sounds and to clearly differentiate between the long and the short sounds of each vowel. Long vowels are symbolized with a line above them, and the short vowels are indicated with a semi-circle above. Children may have a hard time remembering the difference, so the teacher or parent can remind them that the long vowel has a long line above it and says its name. Review which letters are the vowels. Try singing Old Mac Donald Had a Farm and replace "e-i-e-i-o," with "a-e-i-o-u" as a method of memorization. Teach long vowel sounds first by giving several examples. Teach short vowel sounds, and give examples. Hand-out worksheets, and read the instructions. As children progress in their reading, teachers and parents can introduce more advanced lessons. 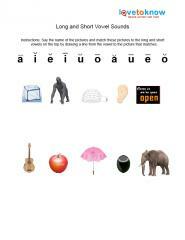 These include blending two letter sounds together such as "ch" and "sh" to form new sounds. These blends should not be introduced until children are comfortable with the individual letter sounds. 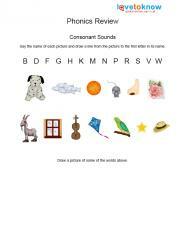 Review individual consonant sounds before attempting blends. Choose familiar blends such as "ch' and "sh." Make a song or chant to help children remember the blend sound such as saying "Cha, Cha, Cha" to help them remember the "ch" sound. Hold up a finger, and say "Shhhhhhhh" to help them remember the "sh" sound. Hand-out worksheets and read instructions. Help children correct their work when they are done. Even kids who have an understanding of letter sounds and blends should occasionally review what they know. Because it is such a fundamental skill, mastering phonics should be a priority for parents and educators. Give students a test on their phonics knowledge. Once their weak areas have been identified, teachers and parents will know where to focus their attention. Use the worksheets to provide instruction and review. Help children correct the worksheets when they are done. Reviewing phonics concepts and rules regularly will help students become more confident and will help them learn how to adeptly sound out words. 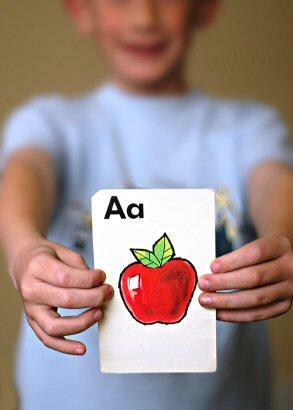 Another way to help review phonics is to play games, and use flash cards.